The wait has finally come to an end. I can now finally stop using the beta version which took around 15-20 seconds to even start. 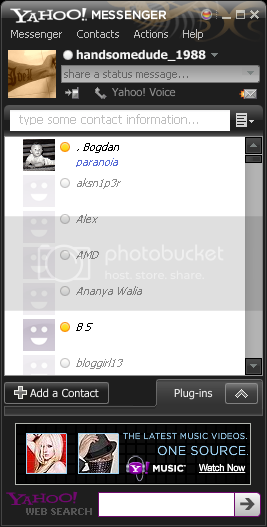 Yahoo messenger 9.0 is available for both XP as well as Vista. So what’s new in the final version 9.0? Yahoo! Messenger Pingbox, a new application has been introduced. This is great if you have a blog or a website. All you need to do is just embed it in your site, if anyone wants to contact you they can do so by chatting from that window. You’ll get the message in your IM. Great isn’t it? To make things colorful there are 12 skins (3 new ones- Silver, Ruby Red, Mystic Black included in final version) which can be switched between. Switching between skins is pretty easy, if you have tried the beta version you’ll know about it. Well, if you don’t then you just need to click on the red button on the right hand top of your screen and choose your favorite skin. Hows the black skin? Looks great isn’t it? Return of the original emoticons: The emoticons are back and are smaller with original designs. Ignore list enhancements: This feature had been a little buggy, in the betas. It’s fixed in the final version. The “ignore anyone not on my Messenger List” option won’t affect messages when you’re in a chat room, but it continues to apply to IMs. Inline video & picture viewer, New emoticons inspired by our users, Import Contacts wizard, Yahoo! Updates, Call forwarding & new voicemail delivery, Yahoo! Games.